Very nice quality for the price. The solid with the print adds a nice touch to the living room and dining room. Dress your windows to impress with this stunning, four-piece panel set. Available in three colors, each set includes two solid panels paired with two geometric print panels for a perfectly coordinated, layered look. The panels also feature metal grommets to make hanging, opening, and closing them effortless—the perfect blend of function and style. I was pleasantly surprised when I opened the package. I was worried the printed Curtain might be too thin. It’s not lined but it’s fairly heavy Material. I ordered the blue and was really happy with the color. These drapes look better than we thought. We did change out the blue panels for plain white and instead used the blue panels on another window. All is lovely and go great in my new dining room. Loved the curtains themselves - but if you need them to be 96" don't get these. The solid sheers are 96", but the geometric panels are all over the place - anywhere from 94" to 95.....NEVER 96". I've ordered other sets to try and get lucky, no luck! Can't advertise as 96" for sure. The curtains arrived as promised, wrapped well and in good condition. They are exactly what we were looking for in our family room. We have decorated in a hybrid farmhouse decor with a 1930's pie cabinet near the sliding glass window that has these draperies, and leaded glass windows on the walls as well as other farmhouse decor, but included some modern touches. These curtains fit the bill. We love the texture, the print and the way they actually let some light through. We hung them straight out of the package and the folds from being packed fell out by the next day. 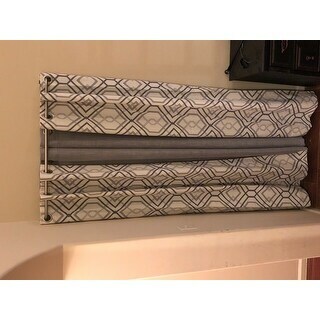 Great curtain panels for our new home! Better than expected.. Very very nice. The quality of this set is fabulous. I purchased these for my living room and I was worried about the color but they are amazing! The color is true to the picture. The gray panels are sheer enough to let a soft amount of light in and the patterned panel block out a good amount of light without being too dark. I ended up purchasing another set for another room I liked them so much! These panels really added some much needed color to my den. Great quality, a bit tough to iron the creases from packaging. But beautiful once hung. This item looks great when put up. A couple of the panels are damaged but not noticible when together. 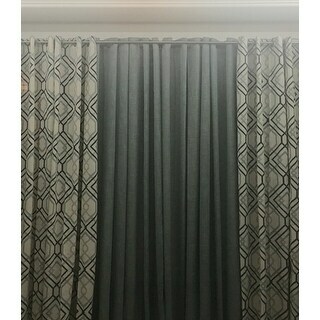 This is a nice curtain, I like the quality and colors. It looks fantastic. Love it. The colors and sizing we true to advertised. Love the look, quality and price. We bought 4 to match in our family room, everyne that comes over loves them. Will continue to buy from overstock.com they have great products at affordable prices. I was very pleasantly surprised by how good these drapes looked and felt in person. Not to mention the incredible value. Love the colors and the complimentary sheers(which are not in these pictures). 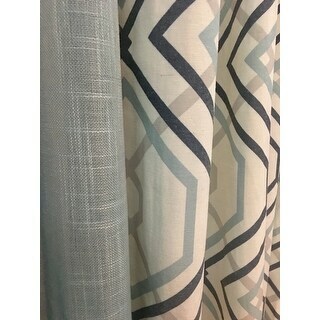 I purchased the blue and white curtains. Color is very pretty in living room. Would recommend for windows but not sliding doors. perfect curtains for my living room. It looks classy, crisp, and clean looking. 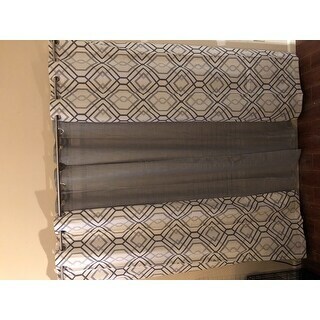 This is a must have curtains and reasonable price as well! Curtains are exactly as described. Length and width fits and looks awesome with our decor. Best part was they are on sale plus I used my O rewards to get the price down even further. It looks great with the rug I got its a bright colors if you're looking for something Bright it's a spring color, My living Room is good and it looks really Good with the walls. "My window is too wide for this 4 piece set. Are the interior panels also available separately to add to my order?" Unfortunately they do not come separately. "my window is 117 inches how many sets do I need"
I believe one set would be enough. "How would you describe the charcoal color? Is it a light or dark grey? What other colors are in the design?" There is silver, light grey and charcoal which is a darker grey. "can somebody tell me whats the width of a single pattern plus a single solid put together? trying to figure out whats 38' width here? what is the total width of the whole set(4 piece panel set)? thanks!!" Together, (2) panels would make 76"- (4) panels should measure 152". "your details say each panel measures 38 by 84. can you please tell me how much does the 96' measure? thanks!" The 96" is the length of the panel. It measures 38 inches wide. 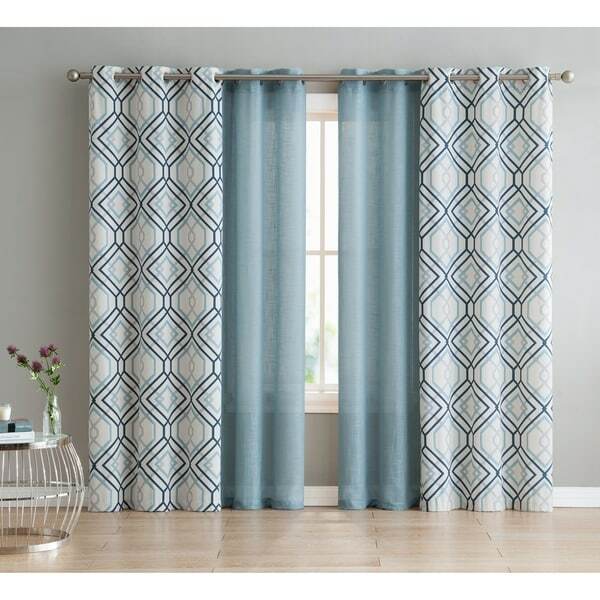 This curtain panel set is also available in a 96 inch length. Each panel measure 38 inches x 96 inches. "Is the yellow pictured the Taupe option?"